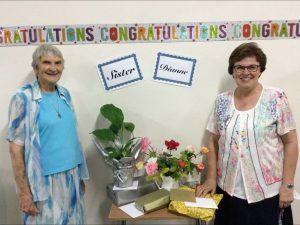 As part of Dianne Colborne’s Final Commitment celebrations, Sr Emilie Cattalini gave a talk on her Reflection on Life Vows. We have all seen those truly awe-inspiring super-slow-motion images of a flower in its first moments of pushing through the earth and into the sunlight. There is so much movement you would swear the plant is dancing. So much movement, so much life! Whole eco-systems all over our planet. We are meant to be breathless with awe at the beauty and amazing inter-dependence and intricacies of creation! To treat everything with respect and protect its place on this small, fragile, magnificent planet of ours. And in that sentence, we have one of the perfect contradictions that the monk wrote about in his journal. Who can forget that image of the blue planet sent back to us from space! Deep in our psyche has been stamped the realisation, as never before, that – for all its magnificence- we live on but a tiny, fragile, round, rotating speck afloat in this vast, vast expanding universe! But what a planet it is! Just enough oxygen in its atmosphere for us to breathe; just enough sunlight for life to thrive; just enough gravity to keep us all grounded! What an amazing work of art! What choreography! What a Dance! It is a world where even the tiniest sub-atomic particle cannot exist except if its relationship to other particles and energies remains intact. Nature knows the steps of the Dance! What has all this got to do with Dianne and the choice she has made to live for the rest of her life as a Religious with the vows of Chastity, Poverty and Obedience? What have these Gospel values to do with nurturing and maintaining a wholesome human eco-system? With people fully human, fully alive? With a magnificent choreography of humanity as dreamed by our Creator? Well, we can move from awe and wonder and interdependence and the joy of all tumbling out of the Womb of God as sisters and brothers; from the sharing and the knowing that ‘with my basket and your basket together’, there is enough for everyone – to, I want to keep my own basket! I may even get jealous of what you have in your basket and plan to take it from you! And it’s not only possession of things. It overflows to status, recognition, praise, fame, an appetite for celebrity, for glamour. Or, it can turn inwards and become a sense of worthlessness, of ‘not good enough’ of helplessness and depression. What’s the answer? How do we, as individuals and as nations, stay with the steps of the Dance?